Mark Twain caused all kinds of trouble. In fact, he reveled in it. He famously advertised his lectures with the tag line, “The Trouble Begins at 8,” and was apparently delighted to share that line with his favorite blackface minstrel troupe, the San Francisco Minstrels. Both Twain and the minstrel troupe played around with variations—”The Insurrection Begins . . . ,” “The Orgies Commence . . .,” “The Inspiration will begin to gush . . . ,” “The Trouble Commences . . .”—but both used the more famous version for years without interruption. One thing is sure. The phrase was indelibly associated with both: “trouble” was their trademark. The San Francisco Minstrels were not what we expect when we think of blackface performance—at least, they weren’t what I expected when I first began researching them—for their popularity was based in part on their political satire. They were satirists who believed that the only possible fodder for a sacred cow was a stick of dynamite, and while they did indeed parody black people, they parodied everyone; they were what John Strasbaugh calls “poly-ethnic offenders” or what Chris Rock terms “equal-opportunity offenders.” And while some of their routines are ugly with racist underpinnings, other routines question these stereotypes as essential categories, challenging ridiculousness, corruption, and pretension wherever they see it. A surprising amount of their material has little direct connection to race at all. Known for end-men Charley Backus’s and Billy Birch’s free-wheeling improvisation on current events, the San Francisco Minstrels attracted nineteenth-century audiences in much the same way that Jon Stewart or Stephen Colbert do today: their satiric spin on current events, politics, and entertainment. 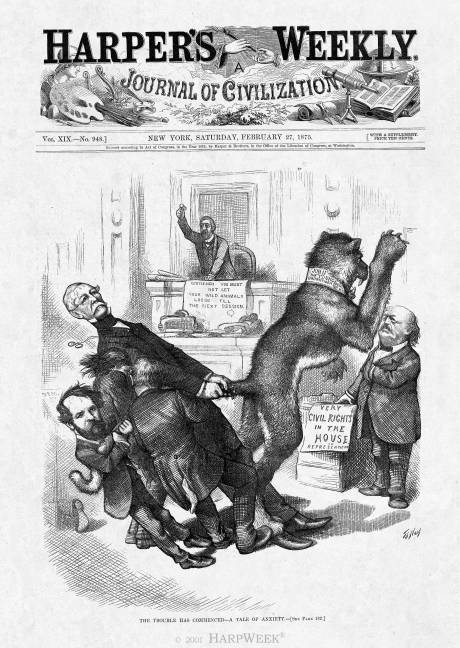 Twain famously wrote in Pudd’nhead Wilson’s calendar that “It could probably be shown by facts and figures that there is no distinctly native American criminal class except Congress.” Charley Backus held a similar view. When asked if he would like to run for Congress, the blackface actor quipped, “No, indeed . . . I only have to play the fool a few hours on the stage, at night; but in Congress, I’d have to play that rôle all the time.” It’s pretty easy to see why Twain enjoyed their performance style. 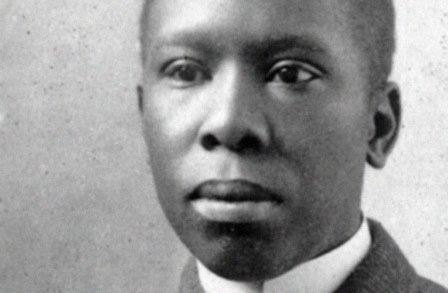 Editors’ note: We are re-blogging this post from Sharon McCoy in honor of Paul Laurence Dunbar’s birthday: June 27th. Last year we posted the poem “An Ante-bellum Sermon” from Paul Laurence Dunbar’s collection, Lyrics of Lowly Life. This week’s poetry entry discusses the historical, literary, and cultural context of that collection and its core humor. The bold red titles below indicate live links to those songsheets, audio files, or websites. Dunbar can be difficult in many ways. His dialect can seem heavy or (to some ears) stereotypical, especially once you know that he wrote for performers who appeared in blackface. We often resist humor in poetry, but blackface offers special challenges that make it difficult for many to want to take Dunbar seriously as a poet. Songs such as Evah Darkey is a King and Who Dat Say Chicken in Dis Crowd can be hard to stomach in the twenty-first century, and even his serious, beautiful dialect pieces such as On Emancipation Day are packaged with lurid period sheet-music covers that wrench credibility. None of this was news to Dunbar. But the era he was writing in offered special challenges in any case. He was born in Dayton, Ohio in 1872, the son of former slaves, just three years after his home state sent a resolution to Congress refusing to ratify the 15th Amendment (prohibiting denial of suffrage on racial grounds). Ohio ultimately relented, withdrew the resolution, and ratified the Amendment, but only when it was clear that it would become law in any case. Emotions still ran strong and tensions high in the state whose antebellum “black laws” had rivaled Louisiana’s for their severity, and it is not surprising that a President from this tension-filled state, Rutherford B. Hayes, facilitated the end of federal Reconstruction. Growing up African American in Ohio required a sense of humor. Even after publishing two books of poetry before the age of 25, Dunbar still had to work as an elevator operator in order to survive, but during that time of economic depression, any job was a blessing. And his poetry had captured the attention of the “dean” of American literature, William Dean Howells. When Howells agreed in 1896 to write the introduction to Dunbar’s Lyrics of Lowly Life, the young poet must have been ecstatic.